X MINUTES is a constantly growing performance project based on the vision of 3 collaborating artists to create an outstanding work of art. Every single performance keeps its uniqueness: For each performance 5 minutes are added, the title changes and the price is rising! Depending on its own success, the show goes on and on, from simple neoliberal logics it turns into a complex journey through time and space. Artists: François Gremaud, Viviane Pavillon, Martin Schick together with Alizée Sourbe, Yuri Sory, Montasir Yousif, Cynthia Bresolin, Benjamin Solano, tbc. Producer: Ingoodcompany | Co-producers: Théâtre Paul Eluard Choisy-le-Roi (F), Pianofabriek Kunstenwerkplaats (BE), Blitz Festival Rovinj (HR), Festival Le Carré-Les Colonnes Bordeaux (F), Théâtre de Vidy Lausanne (CH), KIASMA Museum of Contemporary Art Helsinki (FI), CCS Centre Culturel Suisse, Paris (F), Festival Auawirleben Bern (CH), Festival Novart Bordeaux (F), Fondation d’Art APCd Marly (CH), Snaporazverein Milano (ITA), FAB Festival des Arts Bordeaux (F), Swiss Dance Days 2017 Geneva (CH), Théâtre L’Arsenic Lausanne (CH), Sélection Suisse Festival d'Avignon (CH/F), Migros Kulturprozent (CH), Theaterhaus Gessnerallee Zürich (CH), tbc. X Minutes is supported by Pro Helvetia Switzerland, CORODIS. 70 Minutes was made possible thanks to a support of the Foundation Jan Michalski. 20 MINUTES has become part of the National Finnish Art Collection. "Money is time." X MINUTES is the title of a strong concept, initiated by the 3 Swiss artists Martin Schick, François Gremaud and Viviane Pavillon, and it is a placeholder for an undefined amount of singular performances whose titles are according to the duration of each unit. The concept is based on the idea that the artists create 5 more minutes of show in each place they perform. The first performance is called 5 MINUTES, with a duration of 5 minutes, and is created and performed only at the place of the first buyer! 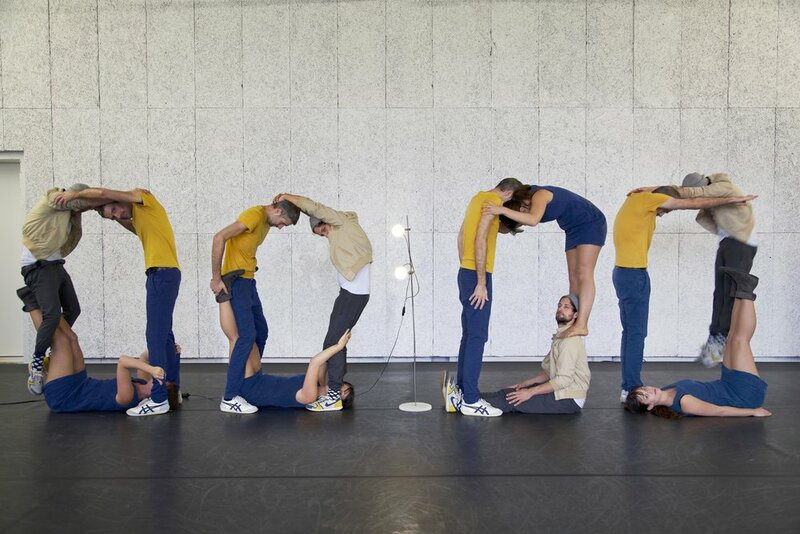 In the frame of Les rencontres de l’Onda at Mac de Créteil in Paris, the artists started selling the project in a public auction, forcing programmers to take risk by investing in a future oriented performance work. Since then, the project made a hilarious journey, as a self-fulfilling art project, creating its existence by its very own success. The project continually writes and performs its own archive, naturally limited by the un-payable price and/or the aliveness of the artists. The playful set up challenges not only the programmers and the audience, but the artists as well. The process of selling and programming within the contemporary art market is made transparent and becomes the performance itself. Neoliberal strategies and logics collide dramatically with the very personal stories of the artists; dreams are paved together until they break again; idealism collides with constant failure and touches the limits of the feasible - A literal production of value, staged as a humorous showdown of contemporary art making. Rules: Each time X MINUTES is performed, 5 more minutes are created and added to the existing minutes of performance. The creation takes place on site according to the local language(s) and the piece is then titled according to the length of performance. Every coproducer/owner of a specific piece is asked to dedicate an object that furthermore has an influence on the performance. Next: 80 MINUTES was bought by Theaterhaus Gessnerallee for a sale price of 6400 CHF. 85 MINUTES will be the 17th performance of the art project X MINUTES and its World Premiere is now available for a minimum price of 8000 CHF!